The Garfield Park Conservatory, located at 300 N. Central Park Ave., is home to 12 acres of indoor and outdoor gardens and over 2,000 varieties of plants, one of which has been growing insatiably for the last week. 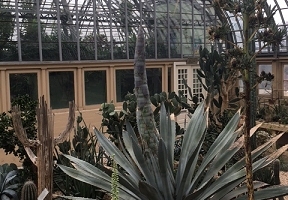 The Agave Americana plant, which normally grows 6 feet tall and up to 8 feet wide, is sending up a flower stalk that is nearly 2 feet tall. In over a period of three weeks, the stalk (or quiote) has grown impressively. 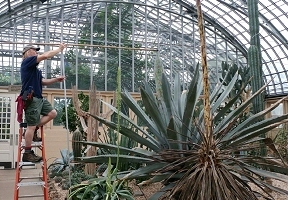 Over the weekend, the stalk grew 11 inches, and Conservatory staff set-up a camera only to record how it flourished an additional 7 inches in just 24 hours. Since then the agave plant has continued to reach upward. The plant came to Chicago and has been growing in the Conservatory’s Desert House for over 50 years. In the wild, these plants reach maturity in approximately 15 to 25 years. The long leave succulent plant produces a flower spire with panicles (branches) topped with flowers that extend outward and contain a sap that is fermented into a drink called pulque. This substance is then distilled to make the spirit mezcal. Mezcal is not the only liquor produced from this plant; tequila is made exclusively from blue agave, one of the many varieties of this plant.